Retired Command Sgt. 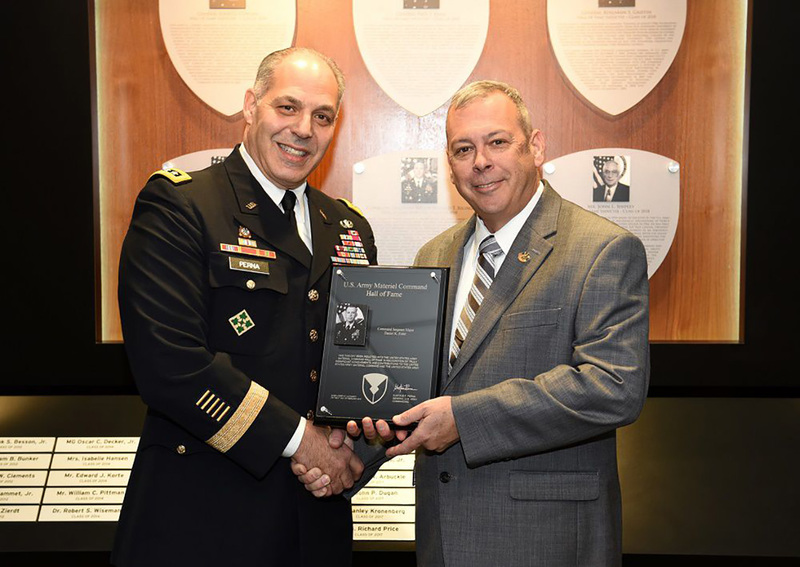 Maj. Daniel Elder, a senior fellow for the Association of the U.S. Army, became the first noncommissioned officer inducted into the Army Materiel Command Hall of Fame in February. At the induction ceremony at Army Materiel Command headquarters, Gen. Gustave Perna, the AMC commanding general, noted that Elder, who served at AMC from 2005-08, was the first noncommissioned officer to be selected. Following right behind him was retired Command Sgt. Maj. Ronald Riling, who served at AMC from 2011-13. “We are recognizing two command sergeants major for what they did here at AMC,” Perna told the audience. “Their approach was not about themselves. It was about what was best for the Army and what was best for this organization. It was a selfless approach. These two gentlemen led the way by enabling their commanders, supporting the staff and helping the workforce accomplish the mission,” Perna said, according to AMC Public Affairs. Elder and Riling were inducted in the Class of 2018 alongside Gen. John Coburn, the 14th AMC commander from 1999 to 2001; Gen. Paul Kern, the 15th AMC commander from 2001-04; Gen. Benjamin Griffin the 16th AMC commander, from 2004-08; and John Shipley, a 58-year Army civilian who served as the director of the Aviation Integration Directorate from 1982 until his retirement in January. Retired Sgt. Maj. of the Army Kenneth O. Preston, AUSA’s vice president for NCO and Soldier Programs, said, “Command Sgt. Maj. Dan Elder served as a distinguished senior NCO throughout his career in many demanding leadership positions. His contributions to Army logistics culminated as the command sergeant major for Army Material Command. “One of Command Sgt. Maj. Elder’s greatest contributions was his advocacy for NCO education, ensuring every soldier and noncommissioned officer eligible attended their professional develop schools,” Preston said.